My Weekly Indicators column is up at XE.com. The recent trends appear to be continuing. 1. The Payne Stewart scenario, where a failure of the cockpit window killed or rendered unconscious the pilot and copilot immediately, and the plane kept flying for hours on autopilot until running out of fuel. Except that looks impossible. You need a decompression severe enough to take out the pilots, take out the transponders, and yet leave everything else intact. Oh, and the plane switches to a new course. 2. Pilot suicide. This is supposedly what happened to EgyptAir flight 990, where a "deadheading" pilot was allowed to take control of the plane and then deliberately crashed it after it took off from JFK Airport. But if the pilot intended to commit suicide, why bother turning off the transponders? Do you continue to fly it for a long time (perhaps 4 or 5 hours) off course before deliberately crashing it? 3. The plane was deliberately diverted by a pilot or hijacker and landed somewhere else, with a further act having already been planned. What we have learned in the last several days has only strengthened the likelihood of scenario number 3. Most importantly, the plane was equipped with a beacon that would send a signal if the plane was about to crash into the ocean. The beacon never went off. In the last 24 hours, more and more officials are saying outright that the disappearance of the airplane was a deliberate act. In fact, as of this morning it appears to be emerging that a series of deliberate acts were undertaken to minimize the likelihood that the plane could be tracked on radar. So the narrative seems to be focusing more and more in the direction of scenario 3. But if scenario 3 is correct, then the persons who planned it are not the underpants gnomes. You know the meme: Step (1) steal underpants. Step (2). ???? Step (3) Profit! No, these persons already have a plan for Step 2. The did not simply park the plane in a hangar somewhere, high five one another, and over a round of celebratory drinks, start discussing what they might be able to do with the plane at some later date. IF scenario 3 is the correct scenario, then the preparations to carry out Act 2 are already in motion. What would be a big enough Event planned for Act 2 to justify all of the planning necessary to actually commandeer a commercial airliner in the manner that took place one week ago? Whatever it is, it must be really Big. If I'm wrong, I'm wrong, and I will have the appropriate egg on my face. But still, while the world media is still obsessing with Act 1, I certainly hope that there are some very smart people in some bunker somewhere analyzing the possibilities for Act 2, and how quickly it might occur. I know, rampant speciulation. And Act 2 might involve any number of targets in that part of the globe, but under the heading of better safe than sorry, if there are any areas of the US coast that have very limited radar coverage offshore, it wouldn't hurt to make sure that they are covered by some kind of heightened alert combat patrols. UPDATE: To make my point as succinctly as possible, I sincerely hope that anti-terrorism authorities worldwide at this point are operating under the assumption that a commercial airliner is being converted into a flying bomb for malign purposes right now. 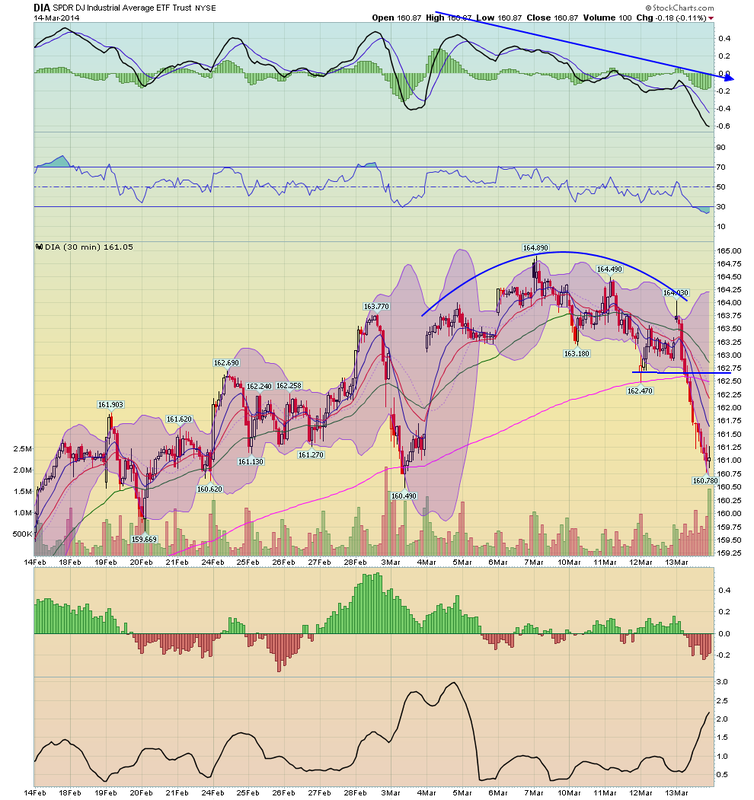 The 30 minute DIA chart shows a rounding top, declining momentum and a sharp sell-off yesterday. 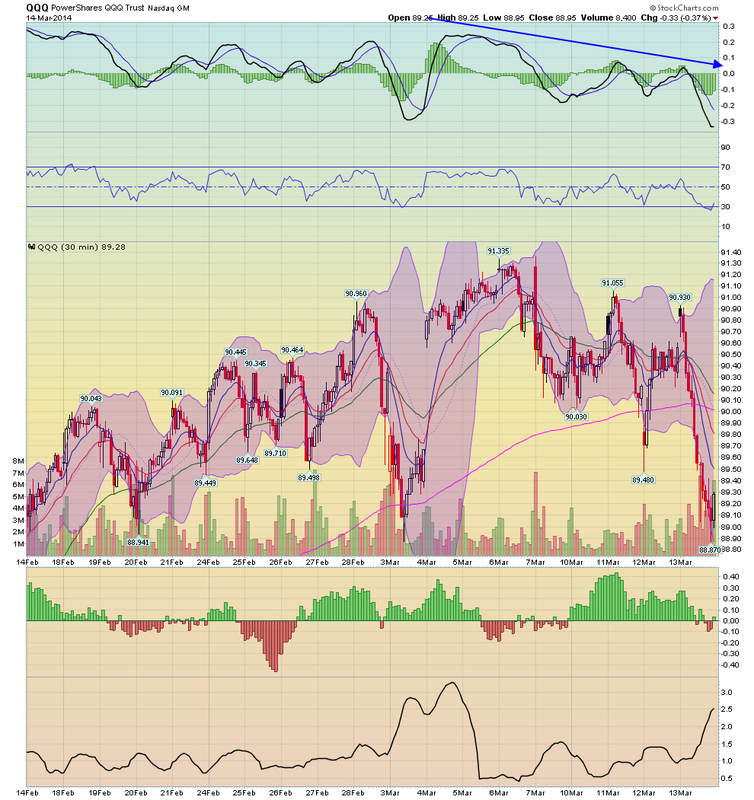 The daily IWM (top chart) and QQQ (bottom chart) show a bearish MACD crossover. None of these developments is fatal. In fact, it's to be expected considering the market has rallied for awhile. But when this information is combined with the DIA forming a double top, the bearish implications are difficult to ignore. Should We Worry About the Latest Chinese Data? 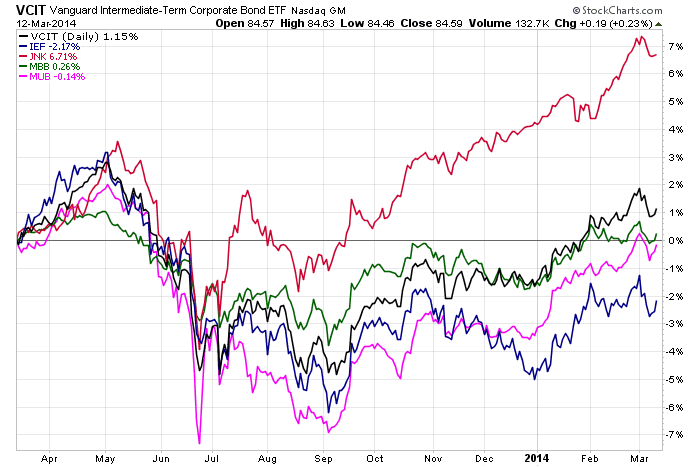 Above is a one year comparison chart of several major bond market ETFs. Keep in mind that some are total market (JNK, MBB and MUB) and some are duration specific (IEF and VCIT), making the comparison a little weak but not entirely moot. The point of the above is that junk bonds are the only sector in the fixed income market that has really done well over the last year. Double Top For the DIAs? Above is a chart of the DIAs. Consider the following points. 1.) Prices have topped out in the upper 164s twice. potential workers who, because of weak job opportunities, are neither employed nor actively seeking a job. In other words, these are people who would be either working or looking for work if job opportunities were significantly stronger. The monthly household jobs survey measures exactly this in a statistic called "not in labor force, want a job now." Despite this, the EPI's "missing workers" metric uses the household report's measure of the unemployed, and measure of the civilian labor force, but then ignores the "not in labor force, want a job now" statistic in the exact same survey, in favor of an extrapolation from the forecast of a 2006 Fed study. There has been no explanation from EPI as to why they have overlooked this actual, monthly-updated obvious metric in favor of an 8 year old study. Mish has published a rate that assumes the 2007 participation rate would have continued, i.e., that there is no such thing as the Baby Boom, whose oldest member was 61 in 2007, but nearly 1/3 of whom have now hit at least the early retirement age of 62. (To be fair, this month he dropped that and focused only on younger workers). The number of discouraged workers rose by nearly 2,000,000 in the wake of the great recession, but has declined by about 1/3 of that number in the last year or so. The usually reported unemployment rate (U3, in red) is currently 6.7%. The "real" unemployment rate including those who want a job but haven't looked (blue) is 10.1%. While this is by no means good, it is important to compare apples to apples. Note that the current rate is only slightly above that of 1995, and even at the height of the late 1990's tech boom, the best economy the US has seen since the 1960's, this rate was 6.7%. The "real" underemployment rate is 16.1% (blue) vs. 12.6% (red). Again, note that even in the 1990's tech boom, this rate never got below 9.9%. Ironically, because I have been critical of both the EPI's and Mish's methods, the above "real" rates for February 2014 are similar to their conclusions. It appears that both EPI and Mish seriously undercounted the number of "missing workers" earlier in the post-recession period. 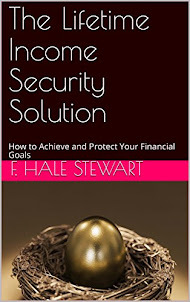 The calculation above is in accord with recent papers by the Atlanta Fed , researchers at the IMF, and Shigeru Fujita of the Philadelphia Fed that, while most of the increase in the "missing workers" initially was due to discouragement, in the several years there has been a relative increase in the number of retiring Boomers, thus reducing the number of those who are "not in the labor force, [but] want a job now." It is also in accord with a recent study by the St. Louis Fed showing that that the older age cohorts have seen a much bigger bounce in their net worth, on average, than younger age cohorts, due to the increase in house prices in the last two years. This means that more older workers have hit their finacnial "target" and felt able to retire. Are Traders Beginning to Question the Japanese Rebound? 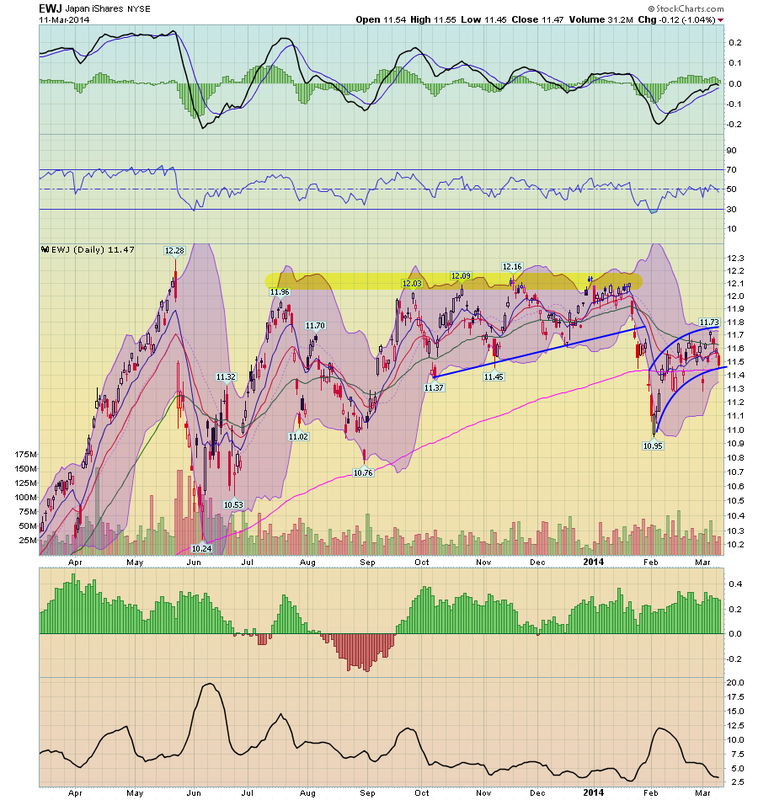 Above is a chart of the Japanese ETF. For the last year, the equity has had a very difficult time getting past the lower 12s. 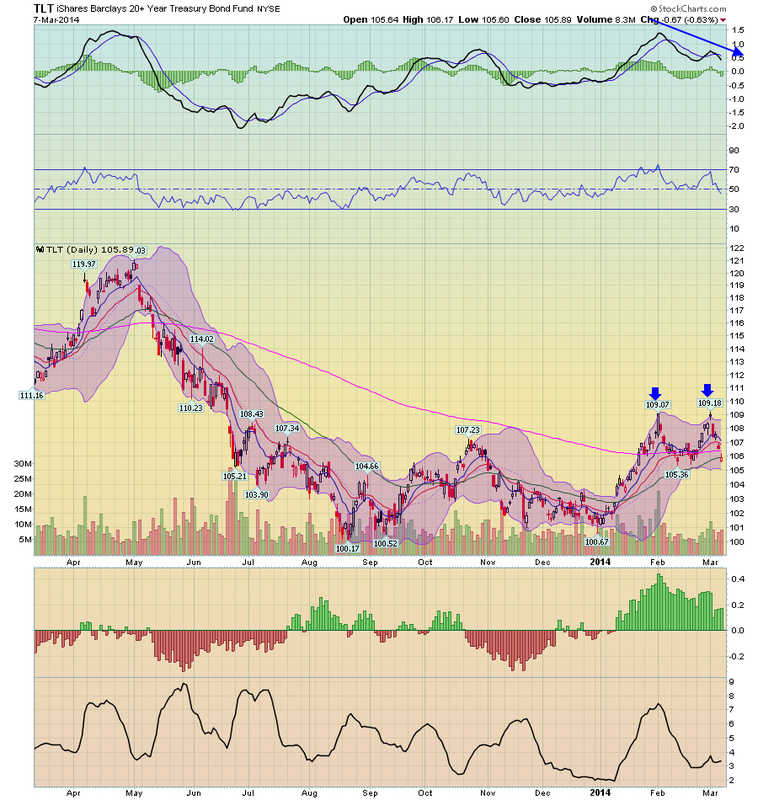 Notice the sharp rally in April and May of last year which was rebuffed at 12.28. Then for the rest of the year the ETF formed a rising wedge pattern with prices hitting resistance in the lower 12s on 5 occasions, with the 5th lasting for half of January. 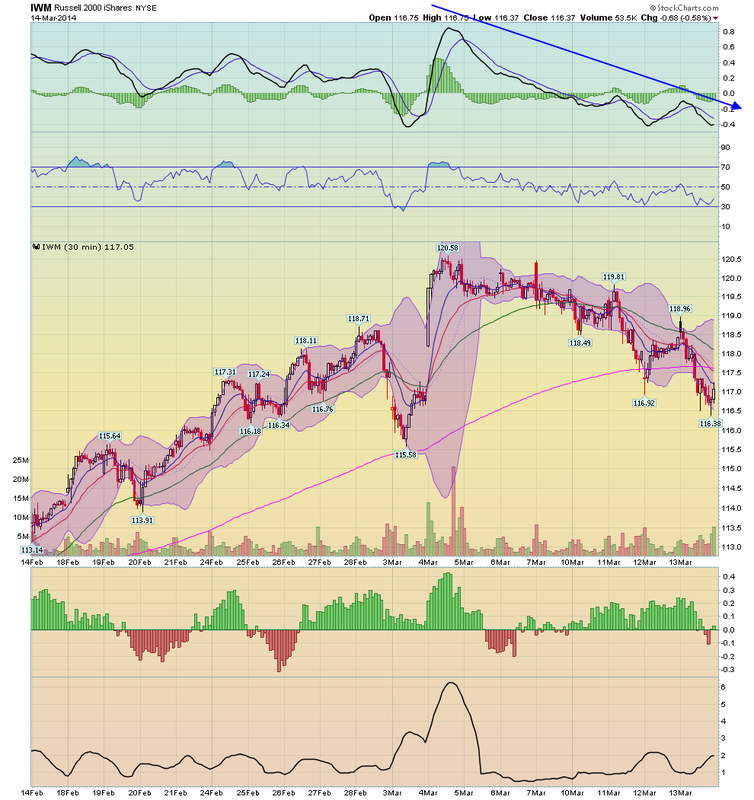 But notice that as that was occurring, momentum (the MACD) was declining. At the beginning of February prices dropped sharply, falling below the 200 day EMA. 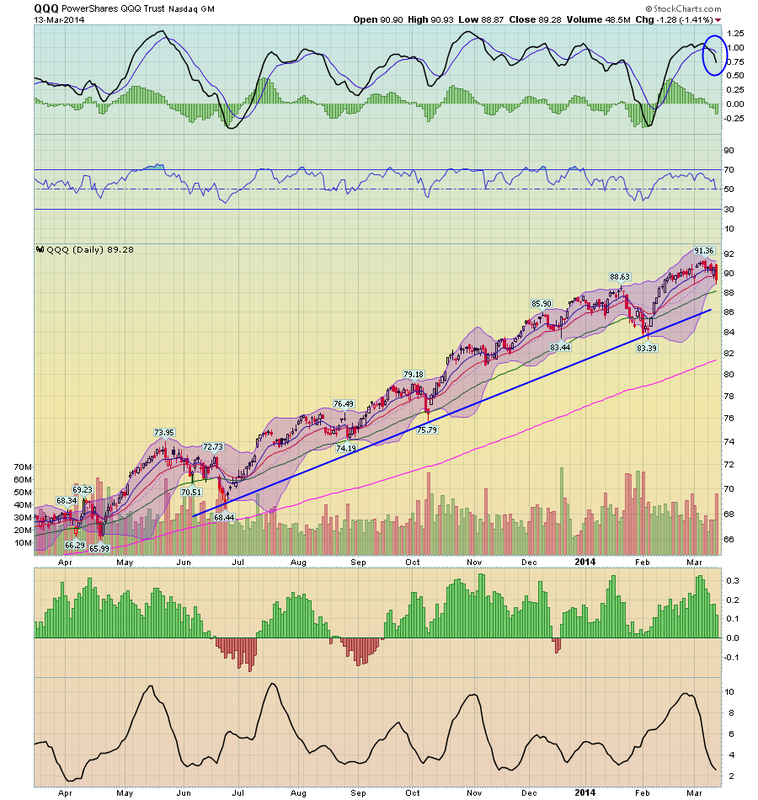 Now prices are above that bull/bear demarcation line but are losing upward momentum again. 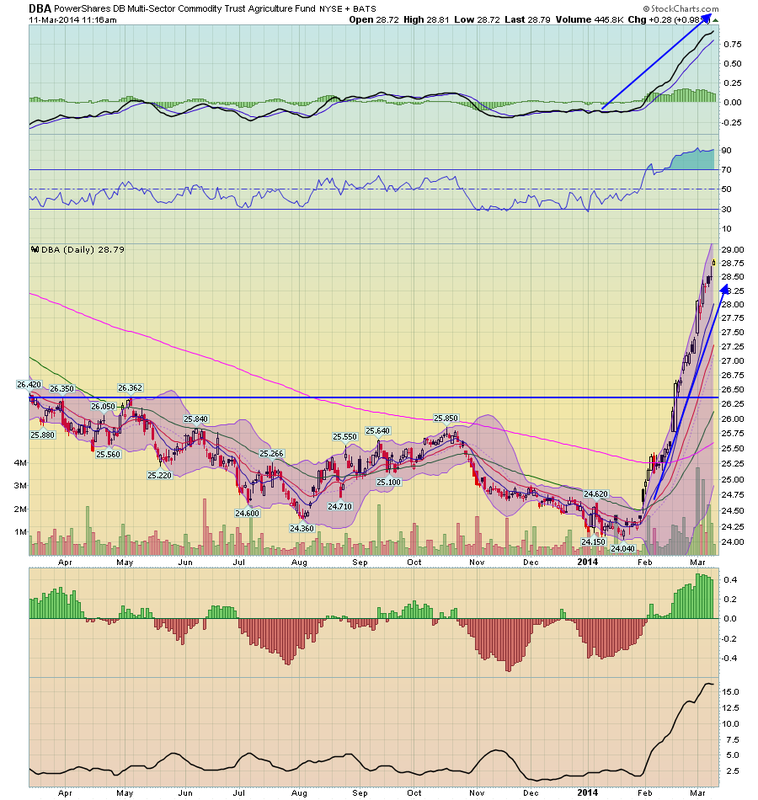 The daily chart of the agricultural ETF shows a nearly parabolic rise over the last most. Prices have moved from ~24.25 to 28.75 -- a rise of about 18.5%. 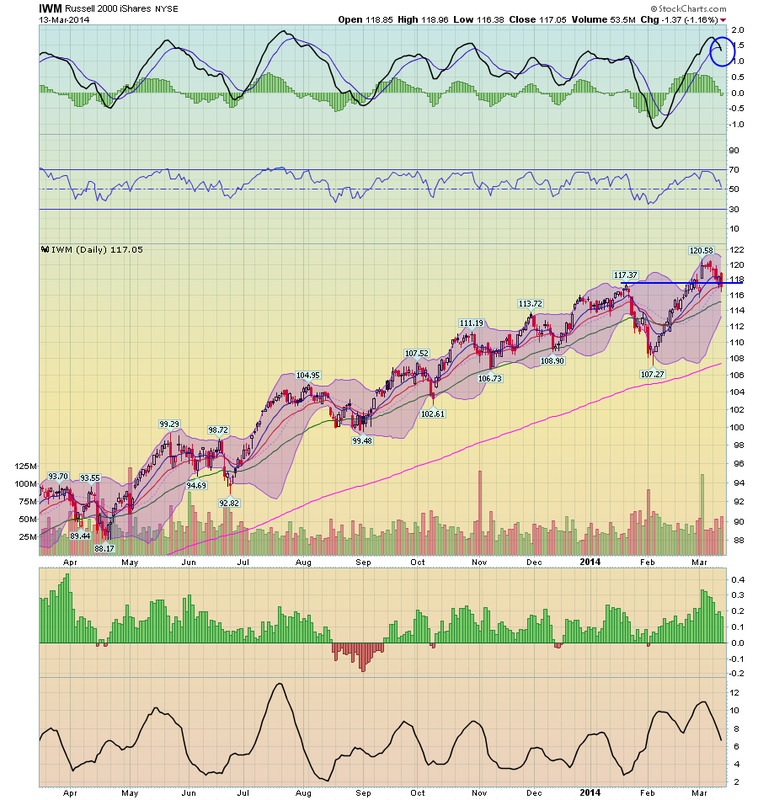 Also notice the very bullish nature of the underlying technical -- a rising MACD, strong money flow into the security and rise in all the short term ETFs. Prices are now clearly above the 200 day EMA. On the weekly chart, we see the strength of the rise relative to the nearly 2-years gradual sell-off in the security. Prices have moved through all the Fibonacci retracement levels from the peak of mid-2012. 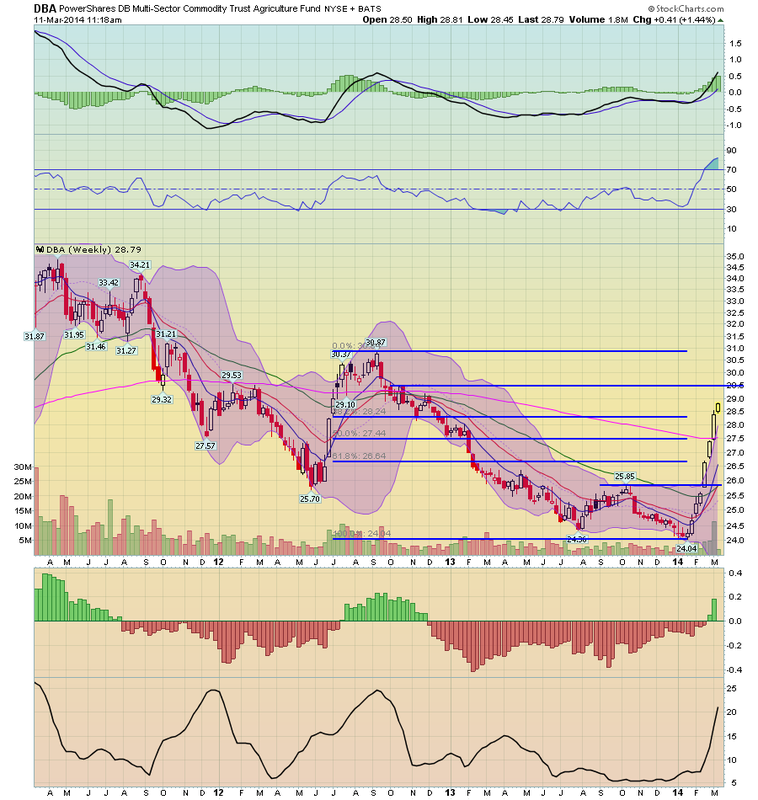 Also note the MACD has plenty of room to run. I have a new post up at XE.com, taking a look at aggregate hours worked in the economy. When we look at employment by using this more granular measure, the US employment picture is much weaker than the headline jobs report. Short Term Top For the TLTs? Above is a chart of the TLTs -- the ETF that tracks the long end of the bond market. The chart has hit the lower 109 level twice in February; the first top occurred in early February at the 109.07 and the second occurred in late February/early March at the 109.18 level. Also note that volume spiked on the first top, but was much weaker on the second. 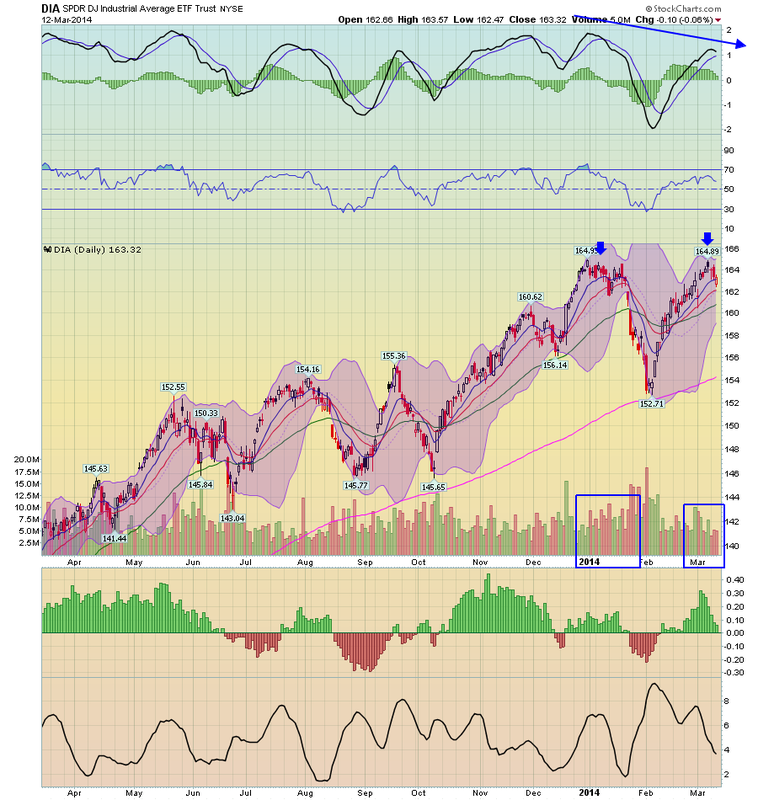 Finally we have a declining MACD, telling us that momentum is declining. My post this past week about the impact of Congress's terminating extended unemployment benefits certainly hit a nerve. There were a slew of google recommendations. At Business Insider, it drew about 25,000 reads and nearly 100 comments. Another site that cross-published it forwarded me emails, one of praise, and several scathing criticisms. All because of the single paragraph I added at the beginning. Take out that first paragraph and the concluding line, and the post is nerdy, straight economic commentary, relying on sources to calculate via simple multiplication the likely impact of the government action particularly as to recent consumer spending. When I read the nearly-finished piece, I was satisfied with the analysis. But as significant as the economic impact is, it seemed to me it was a molehill compared with the contextual moral mountain. Ignoring that moral mountain might have subjected me to criticism from other progressives, and I considered that they would have been right. So I added the first paragraph of moral context. And at Business Insider and other places, the right-wingers went nuts. It's unprofessional. It's not civil. Socialism! Personal responsibility! You see, you're not supposed to rub their noses in the mess they make. Like the controller in the US who controls a drone halfway around the world that drops a bomb from 40,000 feet, you're not supposed to call to their attention the carnage at the wedding party their mistake has caused on the ground. Knowing now the reaction that introductory paragraph caused, if I were writing that post instead of this one, I would still include it.